Just off the 118 (Ronald Reagan) freeway at Tapo Canyon. 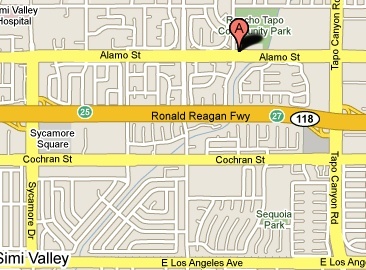 Exit Tapo Canyon and travel west to Alamo Street. Turn right at the corner of Lemon and Alamo. Turn right in the first driveway. (Park Plaza) Once in the parking lot turn right. There are 3 buildings. Our suite is in the building closest to the corner of Lemon and Alamo. Should you need further assistance with directions, please do not hesitate to call our office. Our staff will be more than happy to assist you! 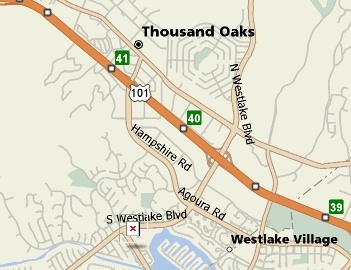 From the 101 (Ventura) freeway, exit Westlake Blvd. Travel south a short distance to Triunfo Cyn. Rd. Make a U-turn. Turn right into the first driveway. (Westshore Medical Plaza) Once in the parking lot turn left and go to the backside of the building. Our suite is on the bottom floor on your right side if you are facing Westlake Bl. at the center of the courtyard by the fountain.